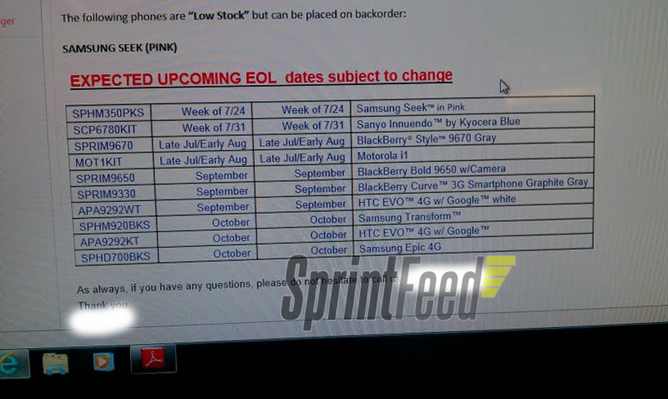 Enthusiast blog SprintFeed has uncovered a screenshot of Sprint's end-of-life (EOL) listings which indicates the handsets that Sprint will cease ordering in the coming weeks and months to free up space for its newer catalogue of devices. The Android devices that will be getting the axe in July include the Motorola i1, followed by the white HTC EVO 4G in September, and the Samsung Transform, black HTC EVO 4G, and Samsung Epic 4G in October. According to SprintFeed if your insured handset is damaged and Sprint is out of stock, you will be provided with a "comparable" replacement. In some cases this can actually be an upgrade!